Knauf EcoBatt® Insulation doesn’t look like any insulation you’ve ever seen, but that’s because its natural brown color represents a level of sustainability we've never before achieved. The color comes from ECOSE® Technology, a revolutionary, new sustainable binder born from five years of intensive research. Based on rapidly renewable bio-based materials rather than non-renewable petroleum-based chemicals commonly used in other insulation products, ECOSE Technology reduces binder embodied energy by up to 70%, and does not contain phenol, formaldehyde, acrylics or artificial colors used to make traditional fiberglass insulation. Knauf EcoBatt Insulation are thermal and acoustical products made from highly resilient, inorganic glass fibers bonded by a thermosetting resin. The products are available unfaced or with kraft, foil, or flame-rated FSK-25 (Foil-Scrim-Kraft) foil facings. 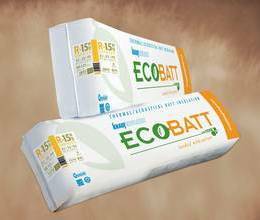 Knauf EcoBatt Insulation are cost-effective thermal and acoustical barriers for energy-efficient construction. Their consistent quality, low dust, and clean-cutting resilient fibers make fabrication easy and installation fast. The products can be used in new and retrofit wood and metal frame applications in residential and commercial structures, as well as in manufactured housing applications. These applications include thermal and acoustical treatments to walls, ceilings, and floors. Knauf EcoBatt QuietTherm® Insulation's excellent acoustical properties reduce sound transmission when properly installed in partition walls, ceilings, and floor assemblies. Knauf EcoBatt Staple-Free Batts are flange-less kraft-faced batts which friction fit between wood studs eliminating the need to staple in place. These batts are designed for use in standard 2" x 4" wood framed construction where the stud spacing is no more than 16" on center. Knauf offers a full line of standard and high-density batts and blankets with a wide range of sizes and R-values. Available unfaced, or with kraft or flame-rated (FSK) foil facings, Knauf's residential insulation can be used for cavity walls, floors, ceilings, attics, basements, and crawl spaces. It is highly resilient, recovering quickly to full thickness. It also greatly reduces the transmission of noise in the house. This full line of standard and high-density batts and blankets for wood and metal frame construction is available unfaced or with kraft, foil, or flame-rated (FSK) foil facings. Knauf EcoBatt QuietTherm Insulation can improve STC ratings in wood stud construction by 3 to 5 points and in metal stud construction by 8 to 10 points, depending on the complexity of the wall configuration and layers of insulation. Knauf's commercial building insulation can be used for exterior and partition walls, floors, crawl spaces, and a variety of ceiling applications. Knauf Manufactured Housing Insulation is a full line of batts and blankets with a wide range of R-values, lengths, and widths. It is designed to work efficiently with pre-manufactured structures of all widths. Available unfaced in widths up to 192" (4.88 m) or with kraft facing in widths up to 24" (610 mm), it can be used for cavity walls, floors, and ceiling applications. And QuietTherm sound batts are available for partition walls. Knauf's full line of retail batts and blankets comes in a wide range of sizes and R-values, and is available unfaced or with kraft facing. Most blankets are conveniently perforated every 94" (2.39 m) to make installation in standard 8' walls a snap, or they can be used as-is to insulate long runs like floor or ceiling areas. This highly resilient insulation recovers quickly for a snug fit and assured thermal performance. Knauf's retail roll packaging has easy-to-identify R-value and application information to help your customers find the right product quickly. Extra-wide stapling flange for faster, easier installation. Durable facing resists tears and is marked in one-foot increments. *Federal Specification HH-I-521F has been canceled and replaced by ASTM C 665. Unfaced and flame-rated (FSK) foil faced products do not exceed 25 Flame Spread, 50 Smoke Developed when tested in accordance with ASTM E 84. Kraft faced products have a water vapor permeance of 1.0 or less. FSK foil faced products have ratings of .04. Foil faced products have ratings of .05. Tested and shown to be below OSHA limits. Diminishes to non-detectable levels within a short time frame. No greater than sterile cotton. Does not support microbial growth or attract insects or vermin. In addition to being classified as mold resistant by GREENGUARD, EcoBatt Insulation has passed exhaustive entomological testing at leading institutions in the US and UK. Our packages feature complete installation instructions and highly visible color coding system, which follows industry standards, making Knauf products easy to select. Knauf packages are lightweight, stack without slipping, and are sized to fit easily under floors and through scuttle holes. Batts are packaged in strong, white poly bags that offer excellent protection from abuse, dust, and moisture. Knauf's unitized packaging combines four batt bags in one convenient banded package, which requires less space for storage and makes loading, unloading, and job site delivery easier. Standard rolls may be skip-chopped to specific lengths and are packaged in clear poly overwrap that protects the product during shipment and storage. Retail rolls stack easily for display and are unitized to simplify storage and handling. Retail rolls have complete DIY installation instructions and helpful product selection guides. (89 mm) 11", 15", 16", 19", 23", 24"
(89 mm) 11", 15", 19", 23"
(159 mm) 11", 15", 16", 19", 23", 24"
(165 mm) 15", 16", 19", 23"
(254 mm) 11", 16", 19", 24"
R-19 6.25" (159 mm) 15", 23", 60"
R-30 10" (254 mm) 16", 24"